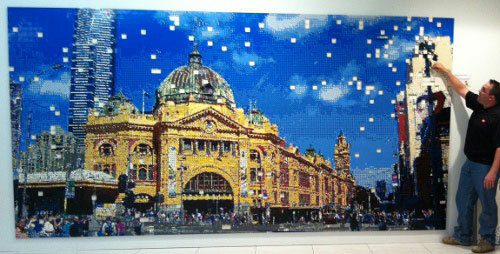 The Flinders Street Station mosaic at Federation Square is now complete. 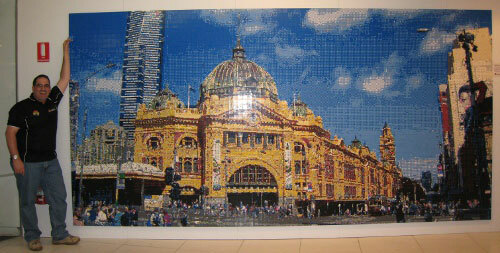 170,000 LEGO bricks, added over 6 days. A great event and thanks to everyone who helped out and came along. 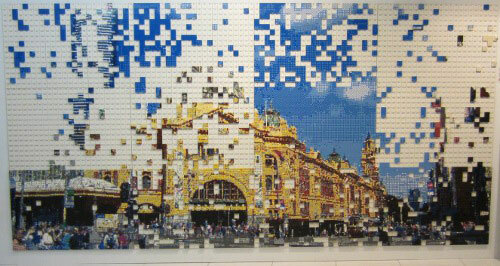 It will remain at the Art of the brick exhibition until the exhibition closes. 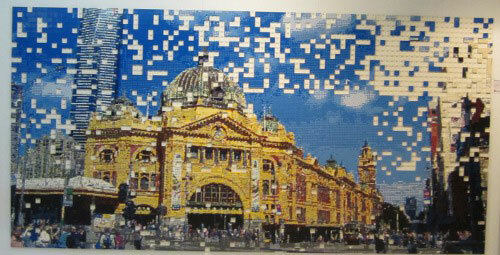 The giant mosaic at Fed Square is almost complete. Not long to go now, Tomorrow it will be finished then a few hours of minor corrections and hey presto. The end of Day 4 of the mosaic build. Not far away from being completed now, I would estimate some 140,000 1×1 bricks have been used thus far. Huge thanks to everyone who has helped thus far, it has been awesome fun! The mystery mosaic well on its way to being revealed. Day 3, A huge crowd and an awesome time.